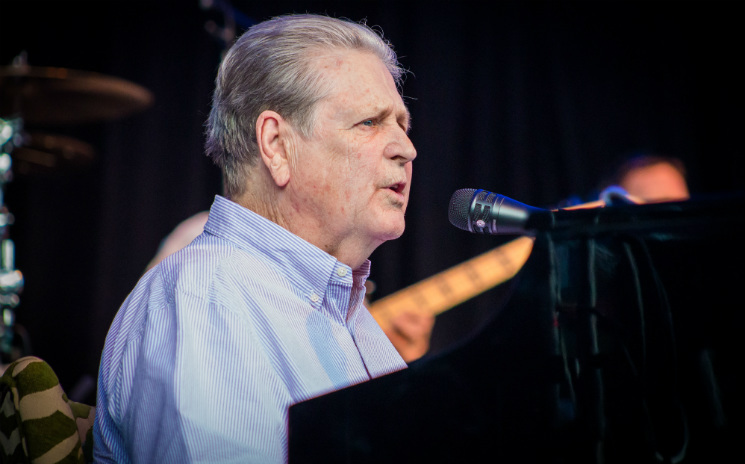 "Love and mercy, that's what you need tonight," sang Brian Wilson on the closing night of the Ottawa Jazz Festival (July 3). "So, love and mercy to you and your friends tonight." Though the songs played on the Confederation Park Main Stage were largely the surf pop that the massive crowd had come to hear, the pop music legend happily promoted a message of kindness and understanding. He was introduced at the end of the show, just before an encore, as the one that, "brings us together with his heart, his soul, and his music!" Now on a 50th anniversary tour of the Beach Boys' Pet Sounds, Brian Wilson, now 74, sat front and centre at a piano, flanked by long-time partners Al Jardine and Blondie Chaplin. Alongside nine other musicians — including Jardine's son Matt, who hit the highest notes in their harmonies — the three powered through every West coast hit they had. Their sunny Cali glow of yore had hardly dimmed. With a gravelly voice that was somehow still boyish, Wilson walked his fans through the hits. With "California Girls," "Surfer Girl" and "California Saga," they moved though the catalogue all to way to 1966. It was that May when the Beach Boys released their 11th album, which came slowly out of the gate and has since become a staple of the pop world. Wilson's skills as an MC were a little clunky, as he soberly and matter-of-factly presented his tunes. But his humour shone through in small moments, as when Chaplin roared through a solo: "The only thing louder on stage tonight is Blondie's shirt." They played Pet Sounds front-to-back, in proper order, and the audience danced and sang along to every tune, especially on the opening "Wouldn't It Be Nice" and the Bahamas folk song "Sloop John B." The titular and instrumental "Pet Sounds" featured the agile guitar of "Nicky Wonder" Walusko, while Chaplin tapped a tambourine to his chest and Paul Mertens, the musical director of the evening who conducted an opening a capella, played a tenor sax with power. A rendition of "Good Vibrations" ended the main set. A single without an album that also turned 50 this year, it would have been the perfect send-off for the evening, but right away, the band members began to trickle back onstage as Mertens introduced them one by one. Then, they partied through a medley encore that swept from "All Summer Long" into favourites like "Barbara Ann" and "Surfin' USA."